NOTRE DAME WITH SIGHT SEEING BOATS Large flat boat filled w/ people floats past Notre Dame. Blue sky w/ white clouds. Lots of pedestrians on the island near the church. SACRE-COEUR ON MONTMARTRE The bright white basilica on the hill. People lounge on the grass. The stairs are not visible. Blue sky & few clouds. Talent is cleared, unless otherwise noted. Crowd shots are not cleared. Landmarks, Paris, France ARC DE TRIOMPHE Traffic moving in both directions passes under the arch. Talent is cleared, unless otherwise noted. Crowd shots are not cleared. THE PYRAMIDS AT THE LOUVRE 2 of the glass pyramids built in 1989 as a new entrance to the Louvre museum. Some people sit on the ground near the small pyramid. Other make their way towards the entrance. There is a fountain between the 2 pyramids. The palace is visible in the background. Shot of the fa ade of the original building. 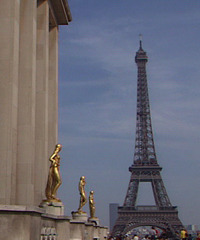 EIFFEL TOWER Appears to be shot from the Trocadero. Lawns, red brick path & reflecting pools in the foreground. The Eiffel Tower against a blue sky w/ white clouds. LEG OF EIFEL TOWER WITH MILITARY ACADEMY Looking through the arch of the Eiffel Tower. The Military Academy (Ecole Militaire) is in the distance. Lots of traffic & pedestrians. CU of one of the platforms of the Eiffel Tower. Talent is cleared, unless otherwise noted. Crowd shots are not cleared. SACRE-COEUR ON MONTMATRE At the bottom of the stairs, looking up at Sacre Coeur. Lots of people on the stairs. Nice shot of the famous building & stairs. EIFFEL TOWER AT DUSK Beautiful pink & blue sky behind the Eiffel Tower. A few lights on the Tower & on the ground. ARC DE TRIOMPHE Diagonal view of the arch. Cars circle around the arch. Blue sky w/ white puffy clouds. EIFFEL TOWER AT NIGHT Blue-black sky, all of the lights on the Tower are lit. Also lots of street lights. EIFFEL TOWER AT NIGHT Black sky, small blue lights on a fountain form a line on the ground that leads to the Tower. The Tower is lit w/ white lights. CHAMPS ELYSEES WITH ARC DE TRIOMPHE Looking down the street, tall trees line either side. Some cars move towards the arch. Traffic is not heavy. CHRISTMAS LIGHT UP ON AVE. DES CHAMPS ELYSEES, PARIS Night. Looking down the center of the road. Trees w/ lights line the street. Lots of auto traffic. Arc de Triomphe in the distance. CHRISTMAS LIGHT UP ON AVE. DES CHAMPS ELYSEES, PARIS Night. MS of Arc de Triomphe. Trees w/ lights line the street. Lots of auto traffic. Interesting flare from car headlights. CHRISTMAS LIGHT UP ON AVE. DES CHAMPS ELYSEES, PARIS Night. Looking down the center of the road. Trees w/ lights line the street. Lots of auto traffic. Lights of a ferris wheel in the near distance. SUNSET WITH LA GRANDE ROUE DE PARIS Large spinning ferris wheel. Rows of parked cars in the foreground. This ferris wheel was built in 1999 & taken down in 2002. THE MOULIN ROUGE, PARIS Night, exterior of cabaret (nightclub). Lots of lights, including the famous windmill. Talent is cleared, unless otherwise noted. Crowd shots are not cleared. NOTRE DAME, PARIS MLS looking up at the building. A street lamp in the foreground. Blue sky. Bright sunlight hits the fa ade, the side of the building is in deep shadow. Pedestrians on the grounds. PLACE VENDOME, PARIS Dusk, looking up at the silhouette on the Vendome Column at the center of the square. Pedestrians & a few cars traverse the square. 2nd shot, looking across the sqaure. Street lamps are lit. Color footage of Paris--touristy, some dirty, some home-movie look. Eiffel Tower and more. Looks late 1940s or early 1950s. LS Eiffel Tower in spring - flowers blooming, cyclists in park. CU-MS pan and tilt up to top of tower. Shot from elevator in Eiffel tower looking down to streets - nice. LS Tower on gray cloudy day. No people. Close shot under the tower with pedestrians and traffic. Tilt up to top of tower. LS Eiffel tower in spring. Eiffel tower on gray cloudy days. Base of tower - tilt up to top. LS top of tower, tilt down. LS Tower with another building in f/g. MS lower part of tower. MS around base of tower. People gathered. Extreme canted angle shot from base of tower looking up. MS Looking squarely at base of tower. LS top of tower shrouded in fog. CU details of the decorative work on parts of the tower structure. MS base of tower - 3 servicemen walk by - tilt up from base of tower. LS tilt down from top of tower - afternoon light. Shots from elevator. Nice overhead shot of sculpted greens and streets of Paris from the top of tower. MS tourists looking through telescopes at top of tower. More shots from elevator. Seine River from the tower. Ext. shot of the elevator. Canted angle of the tower from below. MS through the base of the tower. Buildings and street scenes in Paris. Traffic, pedestrians, crowd. Shot of oncoming traffic headed straight at camera - Arc de Triomphe in b/g. LS Eiffel tower (hazy), WS paris, elevated shot over Champs Elysses with Arc de Triopmhe. Over head shot of Paris. Nice MS of people at newsstand "Byrrh" logo. VS pedestrians and traffic around Arc de Tiomphe. MS people stand at the memorial - flame burning in f/g. Flowers on the ground. CU dedication "Ici Repose Un Soldat Francais Mort Pour La Patrie 1914-1918" with flame. Cu sculpture on the arch. MS Obelisk. Pan from bridge over the Seine River. Public bath? People gathered around a pool. Unidentified building with corinthian columns. TLS tilt up on Eiffel Tower. Overhead, elevated shots of Paris. Master 1848 - Tape 1 LS Seine River in Paris, France, during dusk / sunset. Views of Paris from Eiffel Tower. Nice LS Eiffel Tower, silhouette of wrought-iron gate in FG. TLS steel trestle, view from Eiffel Tower. TLSs of traffic driving in front of the Arc de Triomphe in Paris, France on a hazy day. Master 1487 - Tape 1 Nice panning high angle LS scenic Paris, France, starting with Seine River and stopping at Eiffel Tower. Static LS Eiffel Tower. Master 1791 - Tape 2 Excellent head-on TLS automobiles traveling along Champs Elysees, toward and away from camera, Arc de Triomphe in BG, early evening (headlights on cars, street slights lining street). Post-war France, 1920s: TLS/MSs crowded outdoor caf (cafe) in Paris, waiters in white tuxedos zipping about packed tables; TLSs Caucasians dancing & carousing at a swinging jazz nightclub; MSs hammy motions of a traditional or hot jazz band, comprised entirely of African-American men, performing (drums, trumpet, guitar, sax). President Wilson getting out of carriage in London. President Wilson in Paris. Treaty of Versailles, Paris scenes. Voiceover and Still Photos. are not availble for licensing. Narration and Still Photos are not availble for licensing. Grainy, jerky (but excellent) shots of Paris streets, summer of 1900: well-dressed pedestrians walking about, horse-drawn carriages passing by, people walking by the base of the Eiffel Tower. Tilting LS of the Eiffel Tower. POV (subjective) shot elevator ride up Eiffel Tower, looking out at Paris, girders passing in FG.